Hey nail friends! Welcome to October...and the weekend! This post was supposed to go up yesterday, but I sort of ran out of time, to be honest, and so you get a special weekend post! Hooray! Ready to take a look?! Clever Girl is a soft, muted blue base filled with fine-milled, color-shifting yellow-to-magenta shimmer, as well as scattered holographic shimmer. This is definitely a cool-toned blue, it seems to me. A little bit complex, but cohesive- and very lovely! Formula: It's got a creamy, medium viscosity, but is definitely sheer. Application is a breeze, but you'll probably need three coats to cover visible nail line sufficiently. Depending on coat thickness, some nails were ~85% opaque at two layers, while some were closer to totally opaque, so it just depends on polishing style! A very squishy, delicate look though, if you decide to leave some VNL. Extra Credit is a deeper teal Ultra Holo. I'd say this teal leans to the bluer side, maybe, rather than green, but it's very dependent on lighting. Like all of the Ultra Holos, the holographic effect is intense! Strong enough to be seen in low-lighting, and just amazing in the sun! Formula: It has a medium-thin viscosity that distributes over nail easily, and feels a lot thicker (clings well) during the second coat. Even though the base is a jelly, this is fairly pigmented, considering. Two coats were nicely opaque for me, but that might depend on coat thickness or application style. Excellent texture, though! Mon Amour is a deep, nearly-black, purple holographic with magenta shimmers. The base is a cooler-toned purple, while the shimmer warms everything up quite a lot, making the purple look more red-based. I love that interplay! The shimmer and holo in this shade keep it from looking totally black in most lighting situations. Extra super vampy, intense shade! For some reason I wasn't as excited for this one as I was for some of the others, but it is so stunning once on the nails, especially in direct light! Formula: It's nice! It's sheer if you press too firmly with the brush, but can be nearly opaque on the first coat if you load the brush properly, and float the polish over the nail. Application is easy, and dry-down is very quick! Opaque in two coats! Chocolate Slate is a cool-toned chocolate brown holographic with a lot of purple undertone. There are also gold, yellow, and copper microflakes in addition to the holo. A complex polish, but so beautiful! I was very excited for this one, and it doesn't disappoint! Aside from the holo and shimmer, I don't think I even have another brown with the same wonderful purple tone as Chocolate Slate! Formula: It's on the sheerer side, but the texture is nice, and also dries down very quickly. It builds super well, and as long as you carefully wrap the tips, this'll be easily opaque in two coats. Sitting Fireside is a maroon-based multichrome that has sparse holographic microflakes as well as gold microflakes and red shimmers. The base shifts through a variety of fiery oranges, warm purple, and even yellow at the edges. Perfect for Fall! Formula: It's sheer but the viscosity is on the medium thick side. Application is smooth, and dry-down is quick. This is definitely wearable at two coats (it's opaque on the nail bed), but many people might prefer three thinner coats to build coverage at the nail tips. I used two coats for swatches. Highline is a metallic Ultra Chrome that shifts from orangey-bronzey-copper to gold and green. Sometimes there is a slight hint of blue at the edges at oblique angles, and sometimes there is a reddish tone in the center when looking at the polish straight on. Very shifty! Formula: It's got a great texture and flows over nail well. It's pigmented and can be opaque in two coats if care is taken to wrap nail tips during each coat. For some people, three thinner coats might be easier. Two were good for me! The Harpist is a new Precious Metals shade that seems to straddle the line between soft gold-copper and muted orange bronze. It has the dense metallic flakies that I've come to love and expect from the Precious Metals finish. Formula: It applies like every other Precious Metals shade I've used- which is to say: great brush-feel, very easy to control, instantly self-leveling, and great coverage on the first coat as well. Overall, extremely easy to use and nicely opaque in two coats! Overall, yes, I love these tones for Fall as well as the variety of finishes! 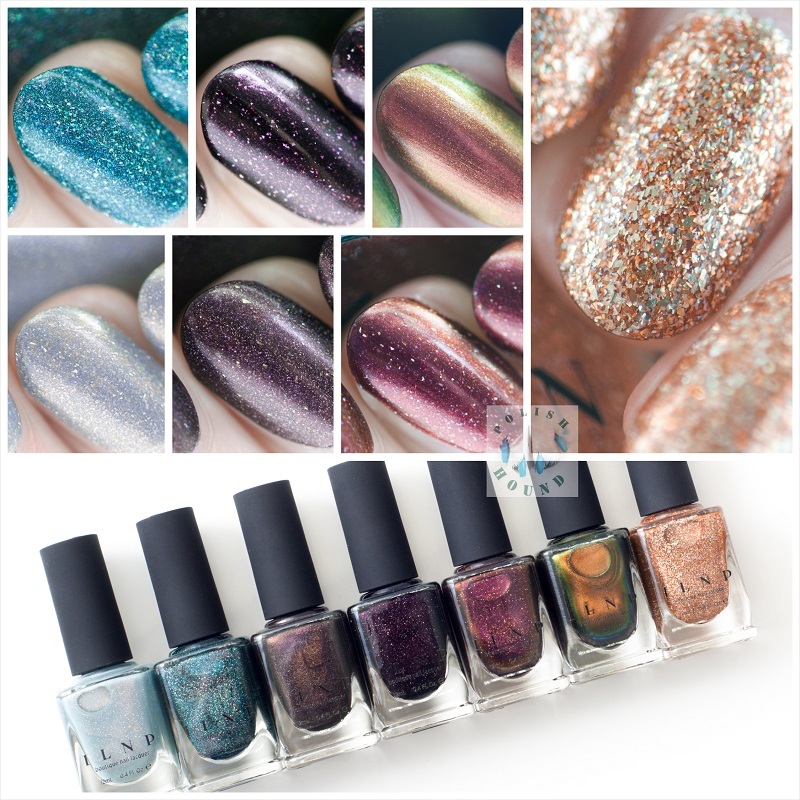 We've got shimmer, holo, silver flake, and multichrome all in the same collection! Each of these polishes is beautiful in its own right, and I'm sure there's something here to please everyone (Except, maybe, creme-lovers- although, come on, this is ILNP!) My personal favorites are Highline, Clever Girl, and Chocolate Slate! As far as formula goes, there's not much to complain about! These have nice textures that are just self-leveling and easy to use. A few of them tend toward sheerness, but that just affected the actual edge of the nail tip for me. All are buildable to two-coat opacity (save Clever Girl) as far as the actual nail bed is concerned. Also, I wore Clever Girl, Chocolate Slate, and The Harpist each for around 3-4 days. All three of them wore super nicely with just minimal tip wear, I am happy to report! Did you spring for any of these pretty shades during the pre-order?